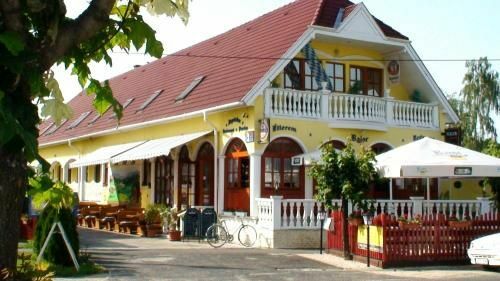 The Bajor Aparthotel Panzió Bükfürdő with family athmosphere can be found in the centre of Bük in an environment with a quiet, peaceful and subalpin climate. The Medical and Thermal Bath is about 1500 meters away from the guest house which can be also reached by bus and the bus stop is 100 metres far. Each room has a private bathroom, a toilet, clean towels, a minibar, a colour TV with various satellite channels, a built-in alarm clock which all ensure our guests' pleasant stay. The atmosphere is very relaxing, our Hungarian dishes are delicious. Occasionally we have live music and you can choose your favourite meal from our menu no matter what time of the day it is, either lunchtime or evening. Another attractive facility is our covered swimming pool with beds for sunbathing, you can use our fitness body-building machines, have a barbecue party in the garden, play badminton, table tennis or hire a bike at a reasonable price! All our guests can take advantage of our infrasauna and massage facilities. There is a car park protected by a video camera which belongs to this building built in 2003. The known thermal bath is nearby as well as the wellness aquapark which we can offer you a discount for. There is a horse-riding facility about 5 km away. The distance from the Austrian ski-runs is 80 km. We now have available 4 additional nwe apartments for bigger families. Apartments located only 200 meters from our main establishment. The Bavarian Guest House is looking forward to all guests all year around, even if you wish to spend a few days or a few weeks. • Alojamiento gratuito para niños menores de 3 años en la habitación de los padres si no requieren cama supletoria. • Se admiten animales de compañía con recargo en el precio de 1000 HUF por día.